From its ancient historical sights to the immaculately preserved traditions of its most isolated tribes, Ethiopia is one of East Africa's most popular cultural destinations. Throughout the year, fascinating religious festivals add an extra touch of colour to the country's towns and cities; while Ethiopia's scenery is both diverse and beautiful. Towering mountain ranges, remote riverine valleys and one of the hottest, lowest places on Earth can all be found within its borders. Ethiopia is a Horn of Africa nation located in the heart of East Africa. It shares its borders with six other countries - Eritrea to the north, Djibouti to the northeast, Somalia to the east, Kenya to the south, South Sudan to the west and Sudan to the northwest. Ethiopia is slightly less than twice the size of Texas, with a total area of 426,372 square miles/ 1,104,300 square kilometres. According to the CIA World Factbook, Ethiopia's population was estimated at 102,374,044 in July 2016. The largest ethnic group in the country is the Oromo people, who account for 34.4% of the population. The official national language of Ethiopia is Amharic, although it is not the most widely spoken. That accolade belongs to the Oromo language, which is the official working language of the state of Oromo. Other states use different official working languages, including Somali, Tigrigna and Afar. The predominant religion in Ethiopia is Ethiopian Orthodox, which accounts for approximately 43% of the population. Islam is also widely practiced, accounting for around 33% of the population; while the remaining percent is largely made up by other Christian denominations. Ethiopia's currency is the birr. For up-to-date exchange rates, try this useful conversion website. Due to its extreme landscapes, Ethiopia has a varied climate that rarely adheres to the usual rules of a country so close to the equator. For example, the Danakil Depression is one of the hottest, driest places on the planet; while the Ethiopian Highlands have been known to see snow. Southern Ethiopia and the surrounding lowlands meanwhile enjoy a tropical climate with lots of heat and humidity. However, most of the country is affected by two distinct rainy seasons. Light rains fall from February to March, followed by heavier rains from June to September. Weatherwise, the best time to visit Ethiopia is during the dry season, which lasts from October to early February. At this time, the weather is generally both dry and sunny. However, better deals on tours and accommodation may be available out of season, while certain religious festivals take place during the rainier months. 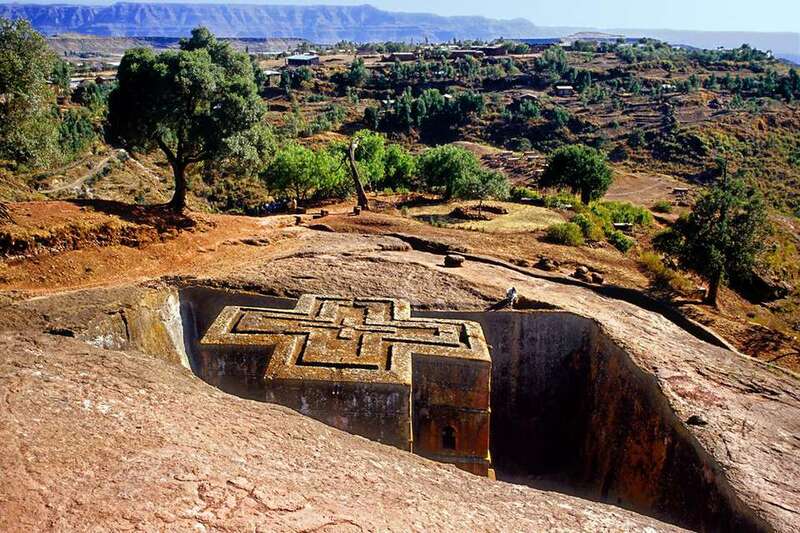 Located at the heart of Ethiopia's Northern Highlands, Lalibela is a UNESCO World Heritage site famous for its monolithic rock-cut churches. During the 12th century, the town was a major pilgrimage site for Orthodox Christians, who used it as an alternative Jerusalem after the original Jerusalem was captured by Muslims in 1187. It is home to the largest monolithic church in the world. Ethiopia's bustling capital is a sprawling city that takes some getting used to. It's a place of contrasts where the rural and the urban come together to create a delightfully eclectic mix of mud huts, glitzy hotels, colorful markets and late night jazz parties. Above all, it's a great place to sample Ethiopia's unique and delicious cuisine. Home to some of the highest peaks in Africa, the breathtaking Simien Mountains are a trekker's wonderland of spectacular waterfalls and plunging gorges. They are also a great place for nature lovers, with plenty of rare flora and fauna including endemic species like the walia ibex and the gelada baboon. The mountains' elevated observation points boast some of the best views in the country. The remote Omo River Region is best (and sometimes exclusively) accessed by 4x4 vehicle or whitewater raft. The journey is worth the effort, however, for the fascinating experience of meeting the valley's indigenous tribes. There are more than 50 Omo River tribes, and with very little outside influence, their traditions and cultures have remained largely unchanged for hundreds of years. The international gateway to Ethiopia is Addis Ababa Bole International Airport (ADD), located approximately 3.7 miles/ 6 kilometres east of the city centre. The airport is a hub for African air travel, and as such direct international flights are available from all over the world including the U.S., Europe and Asia. Visitors from most countries will need a visa to enter Ethiopia, which can be obtained in advance from the Ethiopian embassy or purchased on arrival at the airport. Requirements differ depending on your nationality, so make sure to check which ones apply to you. There are no compulsory vaccinations required for travel to Ethiopia, unless you come from or have recently spent time in a Yellow Fever area - in which case, you must be able to prove that you have been vaccinated against Yellow Fever. Recommended vaccines include Typhoid and Hepatitis A, while some areas of the country carry a risk of malaria and Yellow Fever. If you're travelling to these areas, the appropriate prophylactics or vaccines are highly recommended. Pregnant women should be aware that there is a low risk of Zika Virus in Ethiopia.